Description : Often times, we need to collaborate with others to make decisions. Email, blog, forums and wiki allow us to share information and have asynchronous discussions. Conventional chat requires presence of participants. In vocal discussion over phone, the conversation is lost, only the decisions remain at the closure. 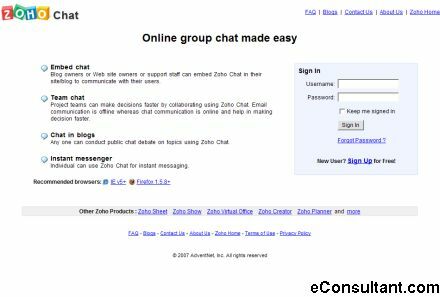 Zoho Chat helps in filling this gap by enabling groups to collaborate and make decisions faster.